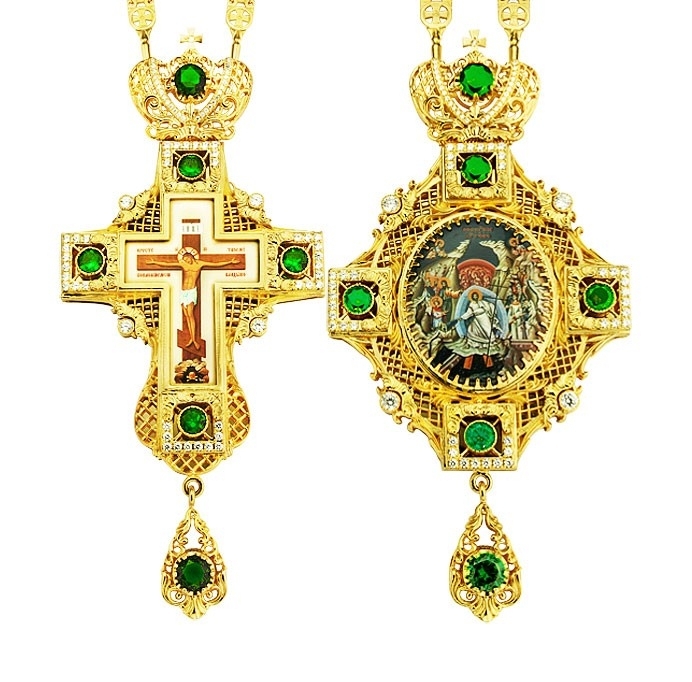 Jewelry Bishop panagia-cross set - A20 - Istok Church Supplies Corp. 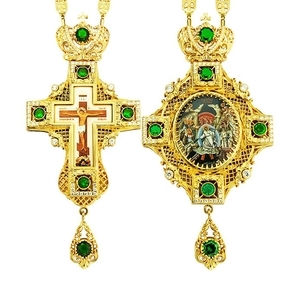 Orthodox Christian Bishop jewelry panagia (encolpion) and pectoral cross set. Excellent Russian-made pieces of art-work made of brass and covered with 24K 4 mkm galvanic gold-gilding. This technology guarantees durability and high quality of the coating. The icon and crucifixion are made using a special technology of applying a color image on a brass base. It is coated with a compound that protects it from mechanical damage and exposure to light. The set is decorated by natural phianite stones of excellent quality. It is sold with chains in a presentable man-made leather packing with a velvet lodgment. Size: 0.0''x0.0'' (x mm).